Muslims for 9/11 Truth: US News covers planned 9/11 truth march! US News covers planned 9/11 truth march! "We want to hold President Obama accountable for his empty promises of creating a transparent government," march organizer Isa Hodge told U.S. News. "What exactly have we spent all our money, lost lives and taken lives for? The entire record of the 9/11 Commission has never been released." The march was announced as the "Million Muslim March" earlier this year, but its name has since been changed to the "Million American March Against Fear," according to Hodge. The organizer said north-central Pennsylvania's Williamsport Tea Party has joined with planners, in addition to groups that adhere to conspiracy theories about the 9/11 attacks or oppose the National Defense Authorization Act, which authorizes the president to approve indefinite detentions. "Depending on my work schedule, I will be attending the event," Nick Defonte of the Williamsport Tea Party told U.S. News. "We all deserve to be judged on our own merits, and that is precisely why I will show my solidarity with peaceful, Constitution-loving citizens." "We're waiting on Minister Louis Farrakhan [of the Nation of Islam] to respond to our request," Hodge said. "His ministers below him are interested in being involved, we're just waiting for Minister Farrakhan to OK it." 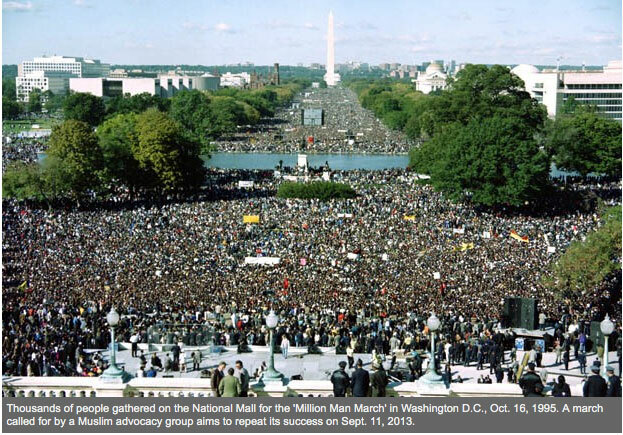 Farrakhan keynoted the 1995 "Million Man March" and his group provided much of the organizational muscle needed to deliver nearly one million attendees to the National Mall for that event. U.S. News was unable to reach the Nation of Islam for comment through its Final Call newspaper. Hodge said he's also trying to persuade former Texas Rep. Ron Paul, R-Texas, to attend. One major Muslim advocacy group, the Council on American-Islamic Relations, will not be joining the event. CAIR spokesman Corey Saylor told U.S. News his group definitely will not participate, but expressed support in theory for the idea of a "Million Muslim March." AMPAC has applied for space on the National Mall for the demonstration. The National Parks Service, according to Hodge, has scheduled a July 28 phone conference about the request, citing "a few questions" about the application. The National Parks Service requires a permit for all large events on the Mall, spokesman Carol Johnson told U.S. News. "We get lots of permit applications daily, so availability is always changing," she said in an email. With the scheduled demonstration less than two months away, a Facebook event advertising the march indicates attendance might be more than 999,000 short of one million, although several ifs could bolster attendance. The event encourages readers to "help us get the truth about 9/11." Hodge has little patience for allegations of insensitivity in picking the date. "There were Muslim firefighters, police officers, first responders," he said. "That day was not only an attack on Americans but a deeper attack on Muslim Americans... we were not only victims but made villains."